Now renowned as among the most famous stigmatics, the mystic visionary Maria Von Morl (15 October 1812-11 January 1868) was born, lived, and died in the village of Kaltern in southern Tyrolia in northern Italy. Her mother was middle class but her father was of the old Tyrolean aristocracy. Maria was the eldest of her parent’s surviving children. Although Maria was always frail, she was given charge of the household during her early teenage years, after her mother died giving birth to her eleventh child. Sometimes, when her father returned home in a state of inebriation, he would pull Maria from her bed and beat her. Maria’s spiritual experiences began early: when she first received Holy Communion at age ten, Maria was so overwhelmed that she fainted when the host was placed on her tongue. After that, her sole goal and desire was union with Jesus. Her experiences included both ecstasies and what at least appeared to be demonic attacks or possession. She spat horsehair, nails, and needles. She tried to throw herself out the window. Several attempts were made to exorcise demons from Maria. When she was seventeen, Maria was assigned a father confessor who remained with her until her death. Father Soyer seemed able to control her ecstasies. He demanded that she obey him, so that he could continue to martyr her without injury to her chastity. Her confessor insisted that she flagellate herself for the purpose of becoming one with Christ’s suffering, as well as to do penance for her own sins and her father’s. In addition, Father Soyer flagellated Maria until her blood splashed the walls. When she was eighteen, Maria became a Franciscan tertiary with Teresa of Avila as her matron saint, but she only moved into the convent after her father’s death. At the end of 1830, Maria was struck by a mysterious malady, which rendered her mute, as she was to remain until virtually the end of her life. Maria was only able to speak in the presence of Father Soyer or her ecclesiastical supervisor. When Maria was twenty-two, she received the stigmata. She hid her wounds until, one day, as a religious procession passed outside her window, Maria fell into such an ecstasy that she levitated in full view of the crowd, exposing the wounds in her hands and feet. The village of Kaltern subsequently became a major pilgrimage site. As many as three-thousand pilgrims converged on the town daily. Forty-thousand visited in the first two months alone. The pope sent his secretary to examine her. This influx of people alarmed civil and church authorities and the pilgrimage to Maria was forbidden, however many continued to visit including bishops, priests, the Empress of Austria, and the poet Clemens Maria Brentano. Eventually the Franciscan Sisters of the Third Order built a small building for Maria beside their convent in order to facilitate this pilgrimage. Maria died on January 11, 1868. 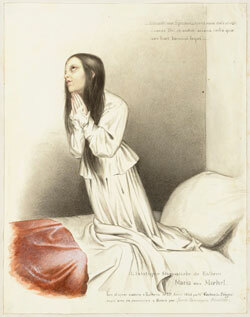 She had prayed that the stigmata would not be visible after her death. Three days before she died, only scars remained and even these disappeared following her death. More information on unofficial saints, the canonization process, and stigmata may be found in the Encyclopedia of Mystics, Saints, and Sages.